A Raspberry Pi + Vintage Vending Machine = Perfect Viral Marketing @Raspberry_Pi #PiDay #RaspberryPi « Adafruit Industries – Makers, hackers, artists, designers and engineers! Cameron Coward makes the case for using pi boards in your viral marketing campaigns in his recent post up on hackster.io. 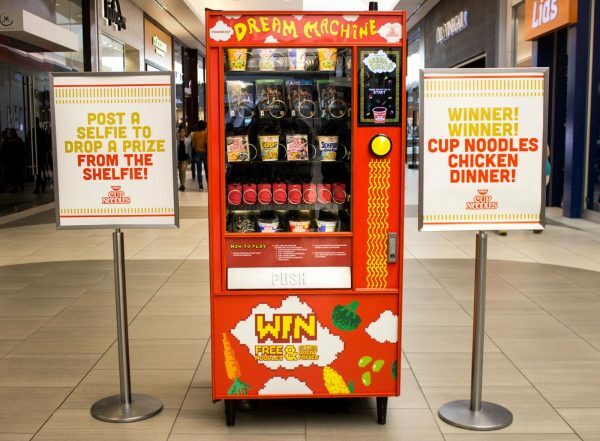 The Dream Machine was built from a vintage vending machine from the ’70s, and upgraded with a Raspberry Pi to make all of that fancy social media tagging work properly. The Raspberry Pi has an LCD screen mounted on the outside of the machine to show consumers what it’s doing, and a simple, big, yellow button to start the hashtagging process. Sure, consumers are posting selfies for corporate gain, but they’re also getting some pretty cool gifts out of the deal.